God is transcendent, therefore He cannot be properly illustrated by anything that belongs to the creation. A simple example suffices to make this point. Since God in His nature is eternal and uncreated, there can be nothing in His created universe that qualifies to illustrate both these characteristics. Yet, because the creation of God bears undeniable evidence of its Author, there are things in nature that may reflect – even though in a very pale way – some of the characteristics of the nature of God. What follows are two analogies from physics that can serve as illustrations for aspects of the Divinity, starting from the premise that what we can know of God is founded on what He Himself has revealed to us through the Holy Scriptures. Therefore, our endeavor to grasp a vision of God through His creation will be directed and restricted to what the Scriptures reveal about the nature of God, for what goes beyond that is pure speculation. The most prominent characteristic of God revealed to us in the Bible is that God is love (1 John 4:8, 16). Love is the very essence of the nature of our Creator. The moment we mention love, we immediately make an association with intimate, meaningful relationships. These, by their very nature, presuppose the existence of at least two persons involved, for love cannot manifest itself if there is only one person and acquires meaning only when expressed toward someone else. Therefore, if God is love, the only One God and LORD has to consist, at the same time, of distinct persons – Father, Son and Holy Spirit - as the Scriptures reveal. I find an appropriate illustration for the triune nature of God deep inside the atom, in its core nucleus. Physicists trying to understand the basic constituents of the physical world came to recognize that baryons - particles like protons and neutrons that compose the nucleus of all atoms – are made up of quarks. Quarks are elementary particles that are perpetually “confined” inside baryons. There are three unique constituent quarks in baryons, inseparably bound together by so called gluons in such a way that the more energy is used in trying to separate them, the more tightly they become bound (Fig. 1). Fig. 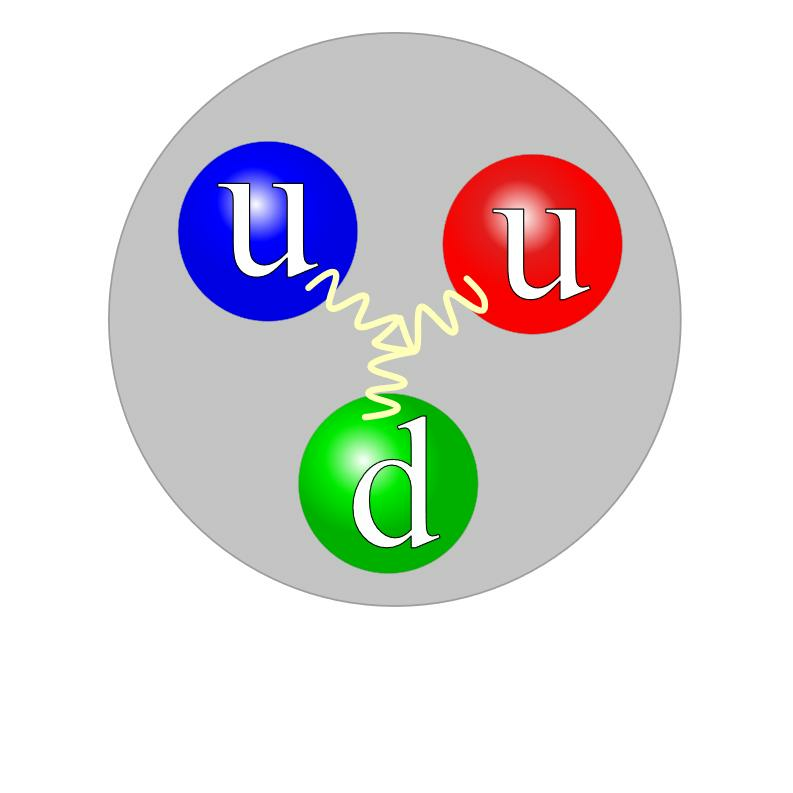 1: Idealized representation of a proton, composed of two up quarks, one down quark, and the gluons (symbolized by springs) that mediate the forces "binding" them together. Image by Jacek Rybak (CC BY-SA 4.0). Of course, we can hit a proton with another proton having an amount of energy so great that the bullet proton and the target proton both break down (disappear) – but surprisingly, the six composing quarks (three from each proton) cannot be “seen,” that is, cannot be detected as such: they become tightly reunited to each other again to become part of confined quarks of other particles that are produced! Moreover, protons are stable particles, that is, left by themselves they can remain forever! So, in my modest attempt at illustrating the triune nature of God, I like to use the analogy of the sub atomic, nuclear particle proton, which is part of the core of the visible matter in the universe: one but composed of three inseparable quarks. It is not without reason that theologians have grappled with the ‘problem’ of the nature of Jesus since He was born into humankind, or as the Scriptures say, “He became flesh.” John 1:1 affirms categorically that Jesus is God. On the other hand, the apostle Paul says that the Mediator between God and humankind is “the man Christ Jesus” (1 Timothy 2:5). So, was Jesus God? Or was He Man? Or was He both God and Man? And if so, in what sense was He both God and Man? In trying to understand the nature of Jesus it is important to focus on what Jesus said of Himself. In this way we may remain safely within the grounds of what has been revealed to us. In John 8:12 Jesus said: “I Am the light of the world”. We can delve deep into this imagery both spiritually and practically to extract some wonderful lessons. First of all, consider how without light there can be no life. On planet Earth, we are all dependent upon the light that comes from the sun, which is the source of the energy that is transferred – amongst other things – into the food we eat and the fuels we use. Thus, in the same way, without Jesus there can be no life. Life is not only a gift from God, but its continuance is warranted only because God sustains it constantly by His power and will. He not only is the light of the world, but He is the Source of light – hence the appropriateness of the name Sun of Righteousness attributed to Jesus: “But to you who fear My name the Sun of Righteousness shall arise with healing in His wings; and you shall go out and grow fat like stall-fed calves” (Malachi 4:2). Modern physics has to deal with two seemingly incompatible concepts of classical physics: the particle-like and wave-like character of light. 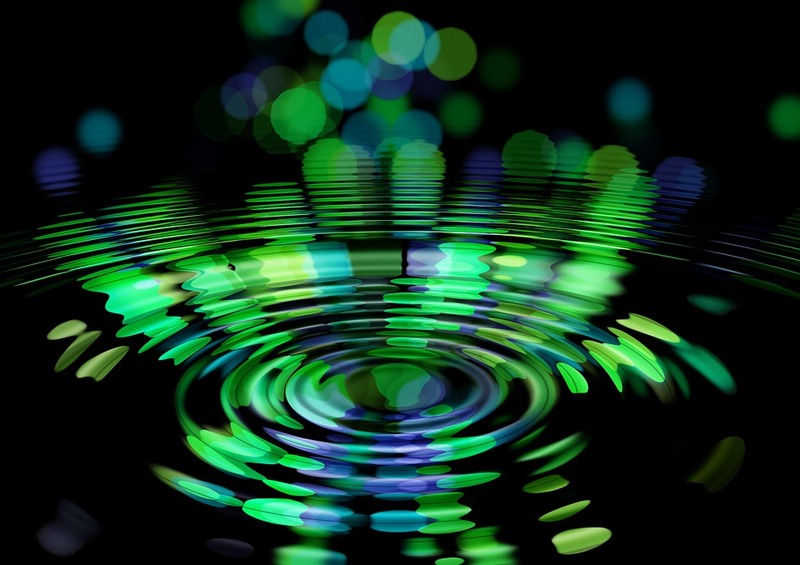 Thus we talk about the “wave-particle duality” when referring to the nature of light. What does it mean to say that light has this dual nature? Well, as bewildering as it may be, light behaves like a wave (it is an electromagnetic wave, for sure) in certain phenomena, while in certain other phenomena it behaves like a particle (it is a photon, a particle of light, for sure). A phenomenon like the interference of light can only be explained thinking of light as a wave. On the other hand, a phenomenon like the photoelectric effect can only be explained when we consider light as particles – photons - which carry not only energy, but also momentum. Bearing in mind that classically we define the momentum of a particle as the product of its mass times its velocity, photons – though massless (i.e., zero mass) are particles that have definite (non zero) momentum! This is something that we cannot quite understand. We could only vaguely describe a photon as some kind of particle without mass, being pure “packets of energy” (but remember, it has momentum, too!). The only way out for physicists confronted with this conundrum has been to consider light as both wave and particle at the same time. Or, in the jargon of the ‘experts,’ light has a dual nature, the wave-particle duality. Now, consider how fitting this is when Jesus describes Himself as the Light of the world. He is the only One in the whole universe that bears in His personhood the dual nature: the divine nature (He was, is, and always will be God) and the human nature (He became flesh, taking upon Himself humanity). Jesus dying on the cross was fully human; Jesus on the Mount of Transfiguration was fully divine. Theologically we understand the dual nature of Jesus as a necessary condition for the plan of salvation: because the “wages of sin is death” (Romans 6:23), Jesus had to be fully divine to be our Savior (to be able to give us life again) and at the same time He had to be fully human (to be able to be our Substitute, to die in our stead, as a ransom for our life). In nature, there are many different types of waves: some visible, like water waves that can be seen on the seashore; some invisible, like the sound waves we hear from a radio. Technically, a wave can be loosely defined as an oscillation (or even some perturbation) that travels through space (with or without matter), transferring energy from one place to another. Particles, on the other hand, are understood in physics as (almost) dimensionless localized bodies or objects to which certain qualities or properties (physical, chemical, etc.) such as mass, spin, charge, etc., may be attributed. Light has these two characteristics intrinsically: it is an electromagnetic wave and a particle at the same time. The divine nature of Jesus Christ could be compared to the wave-like nature of the physical light, because He left the glorious courts of Heaven and came to Earth to carry with Him life to bestow on us. His human nature, on the other hand, could be compared to the particle-like nature of light, because when He took humanity upon Himself, He became localized in space, having become a physical body. We also learn in high school physics classes that light is the only wave (electromagnetic wave) that can travel through empty space (without a matter medium). In other words, light of the remotest corners of the universe can reach us because it penetrates through even the almost perfect vacuum and darkness that exists between galaxies. In the same manner, the light of Jesus can penetrate even the emptiness and darkness of death to bring us back into life. No matter how far out we may have distanced ourselves from the Source of Light, still its saving rays may reach, heal, and save us. How marvelous, gracious, and merciful is our God and Savior, the Light of the world!